You can have the best sails in the world, but if they’re not trimmed properly, sailing performance will suffer. Take a look at the seven case study photos below. In each case study, Ian Short comments on the sail trim. By better understanding the fine points of spinnaker trim, you can get more drive from your sails and that’s how you win races. 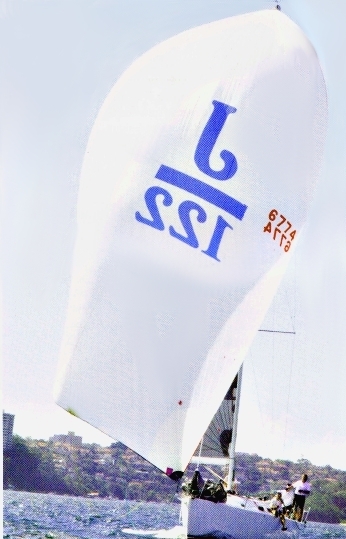 CASE 1 – Asymmetric spinnaker on a J122. Ian Short’s analysis: The boat is sailing too square. The asymmetric is collapsing in the centre of the head. It’s true squre a true wind angle. The trim is no good. They should have the tweaker on; it would pull the head down and in. 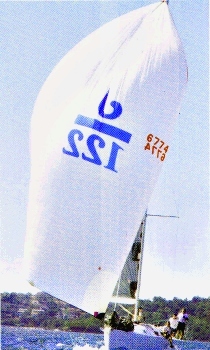 This photo illustrates a common mistake which is trying to sail too square with an asymmetric spinnaker. Ian Short’s analysis: This is the same J-122 as in Case 1 above. The spinnaker trim is much better with more tweaker on the spinnaker sheet and the boat is on the correct true wind angle; not too square as the shot above. 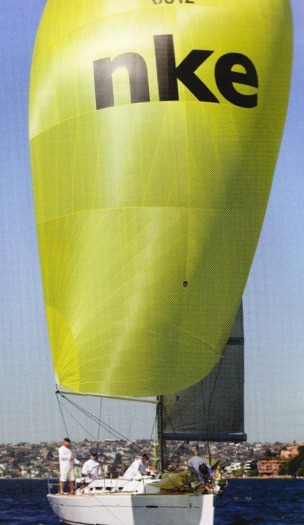 Ian Short’s analysis: This is an asymmetric spinnaker on a J-122. It’s nicely trimmed. The telltales are flowing. With Asymmetrics, you should trim to the telltales, rather than the curl on the leading edge. It’s a lot more accurate and gives you better performance. It’s reaching. The tweakers are off on the sheet opening up the leach. The head is full. The spinnaker is nicely trimmed. Ian Short’s analysis: This is a Beneteau First 40 flying a symmetric spinnaker. The clue and Tack are too lopsided. They need to bring the tweaker on to lower the clew more in line with the spinnaker pole. In turn this will tighten the leech. The leech is too open. They would get a lot more horsepower with the tweaker on. 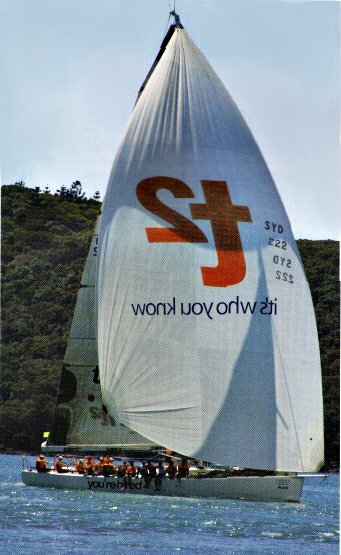 Ian Short’s analysis: This boat is flying an asymmetric spinnaker in light winds at last years Hamilton Island Race Week. It’s an asymmetric spinnaker. It looks like the spinnaker is too heavy for the light reaching conditions. i.e the sail cloth is too heavy. Also, the sail is slightly overtrimmed. You can tell by the vertical creasing in the head, it’s collapsing in that area; which tells you the sail isn’t setting properly. If you eased the sheet a metre and a half it would fill out and hold its design shape much better. So. Its slightly over sheeted and too heavy a spinnaker for the conditions. Ian Short’s analysis: The three windward boats are flying asymmetric spinnakers. All of them are set quite well and working well in the conditions. 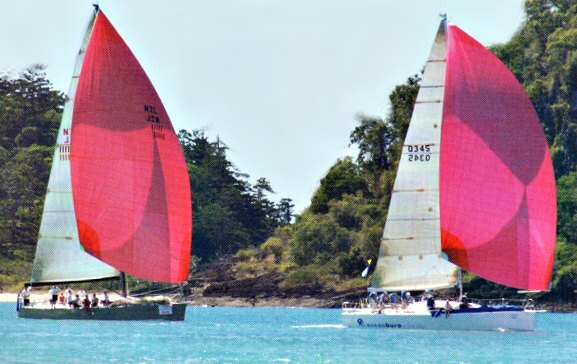 The next two boats are flying asymmetric spinnakers. The biggest difference is that the asymmetrics are a little bit flatter and straighter on the exit on the leach, whereas symmetrics are fuller. The asymmetric at the end doesn’t look good, but that’s because its getting covered by the boats to windward. We recommend tell tales on asymmetrics for optimum sheeting trim, but not for symmetrics where trimming off the luff curl is still the best way. Tell tales take all th egeuss work out of trimming assymetrics. Where should the telltales be on asymmetrics? WE put ours about 300- 400 mmm from the luff at Â¼, Â½, and Â¾ heightand this allows you to see the airflow over both sides of the sail. Ian Short’s analysis: The boat in the front looks good . Its is flying the asymmetric on a pole. The one behind doesn’t look so good. It’s slightly oversheeted and doesn’t look nearly as potent. Having tell tales at 1/4, 1/2 and 3/4 positions up the luff takes all the guess work out of trimming the sail. The lead boat is trimmed properly. The boat behind is slightly over-sheeted for that angle.